Although they sound the same, bits and bytes are different from one another. Both refer to an amount of information or data, but they're different sizes. A bit (represented by a lowercase 'b') is a binary digit 1 or 0, and a byte (represented by an uppercase 'B') is eight of these. This means a kilobyte (Kb) is eight times larger than a kilobit (kb), and a megabyte (MB) is eight times larger than a megabit (Mb). Part of the reason for the confusion is that files sizes are usually displayed in bytes, but internet speeds are always shown in bits. We've simplified things with our download speed calculator, which will show you the actual time to download different file types. Below is a table full of theoretical speeds. The file size is written in megabytes and the speeds are in megabits. Four, eight, 16, 32, 50, and 100 approximate some of the most common speeds in broadband across ADSL, fibre, cable and 4G mobile broadband connections. The table below will tell you approximately how long, in minutes and seconds, the file types on the left will take to download using the speeds on the right. Keep in mind when you read the table that actual speed isn't always as fast as advertised speeds, and there are many additional factors that affect speed. Therefore, these times are only a guideline and may take a bit longer — or, if you're lucky, be a bit shorter. The columns on the left represent typical ADSL broadband speeds, ranging from 4Mbps to 16Mbps. 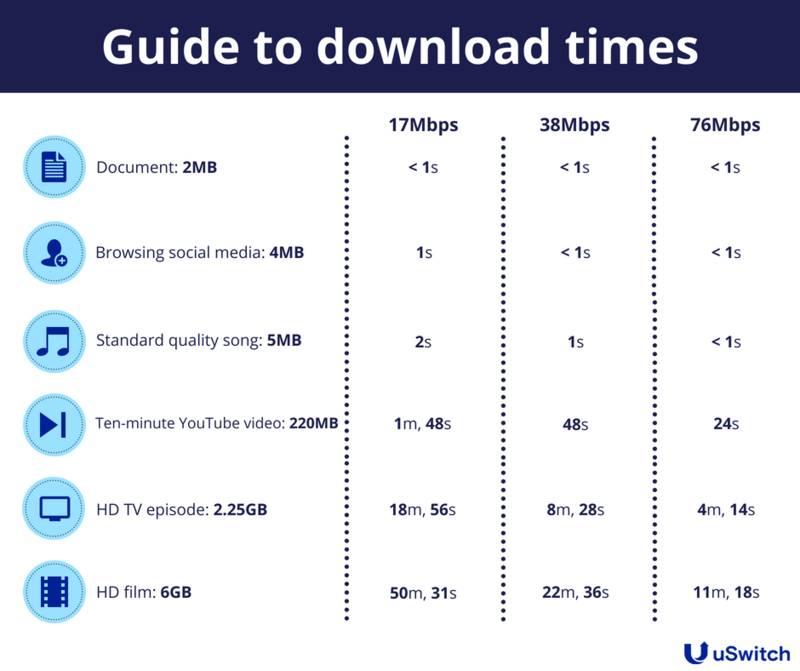 To download HD films in under 10 minutes, for example, you'll need to look at getting fibre broadband, which gives you speeds from 36Mbps or faster, depending on the provider. Don't know what fibre broadband is? Read our guide to fibre broadband. Megabits are written Mb, and megabytes are written as MB. All internet speeds are measured in bits per second. A broadband package with an average speed of 8Mbps means the maximum you will get is eight megabits per second, or the equivalent of one megabyte per second. Doing the maths, this means if a provider or salesperson tries to tell you that an 8Mbps internet connection is equal to eight megabytes per second, they are wrong to a factor of eight. Sometimes they'll try to get around this by simply referring to 'megs', which is unhelpful as it doesn’t indicate what they are actually referring to. Ask them whether they mean bits or bytes and you'll never be misled again. Speed is always denoted by time, typically written in seconds. All internet speeds should be written as 'Mbps' and not 'Mb' because without specifying the time taken, it's a size, not a speed. It's important to remember that internet speeds aren't always as fast as they say they are. An 8Mbps line means that under the best circumstances (i.e. you live inside a telephone exchange box and don’t share your line with anyone), you will get 8Mbps. In reality, speeds are usually lower. A download time is affected by many things: Line sharing (also known as contention ratio), time of day, distance from telephone exchange and quality of wiring (in your house and in the street) all factor into your actual broadband speed. This isn't always the fault of the provider; it typically depends on who you are connecting to and where they are. The exception to this is if you're using a fibre to the premises broadband service, which is unaffected by the distance you live from the exchange. Even with this more reliable kind of connection, however, your speed will still be impacted by the number of customers using the service at any one time.